HAPPY MOTHERS DAY. Hope you have an awesome day and your day is special and filled with fun and family. My son is taking me and hubby to lunch at a favorite restaurant Anthonys Home port in Olympia.. Yum. I am sure I will hear from my daughter who lives out of state and my other son who lives out of state.. Miss them and so proud of all my children. I have been blessed. This is another card I made. This is new designer paper I got from my friend Karen. It's along the line of Christmas but who says it has to be just because it's silver. I used the dp for the envelope and another piece for the background. 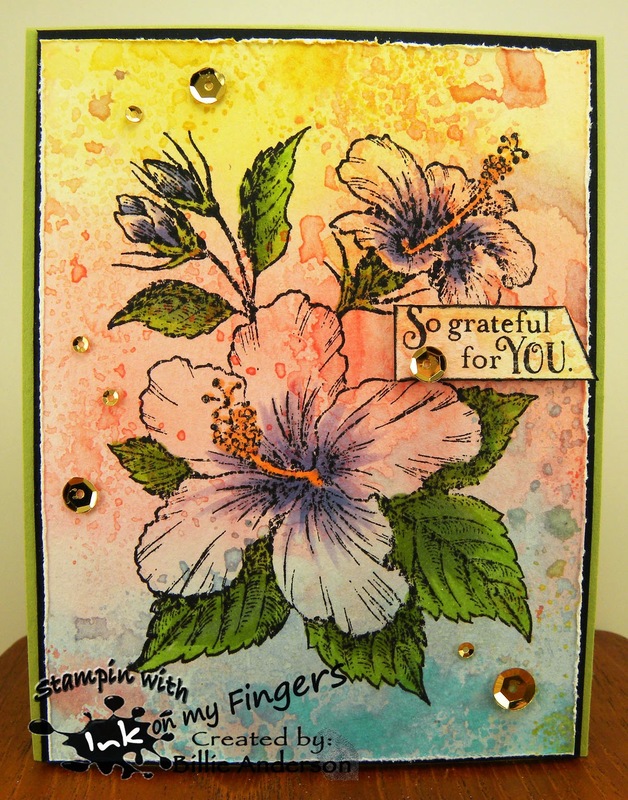 I used the leaf die from Taylored Expressions and then had this strip of sentiment from Quick Quote so just cut it down to fit across the card. I used a piece of black behind to give it a pop. Simple and fun. This is another blanket I made using the same method as yesterdays blanket. This one is smaller it's 23x23.. don't ask, why I don't want to talk about it.. but if you see yesterdays post you will remember to look at the corners before you sew and cut them off.. This will be a nice changing blanket or light blanket or maybe when the child is little older perfect size for them to carry around.. who knows. I love the bright colors. Flannels come in some really cute prints. I made two more burp cloths. Well today I am sharing a baby receiving blanket and burp cloths that fit over the shoulder. The baby receiving blanket is a design from Missouri Star Quilters. I went to U-Tube and watched the video. I first found out about the blanket from my dear friend Karen. It's a unique way of making the blanket. You cut the background at 40 inches and the front at 30 inches and sew together face to face. Then you will have these ears (corners) and you need to watch the video but you draw a line which when sewn you get a miter corners. You turn the blanket inside out and then top stitch the seam to finish it off and that also closes the opening. Its quite simple.. The corner and the way you sew them is the trick to making the miter.. before you cut it remember to look turn the corner inside out and make sure it's correct. 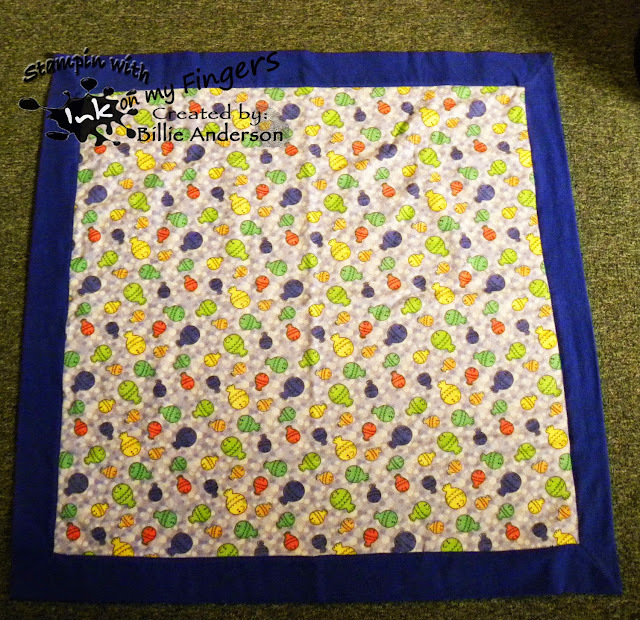 The burp cloth is just a simple pattern and sewn together and turned right side out and top stitch. There is enough material for at least one. I bought little extra so had enough to do two. 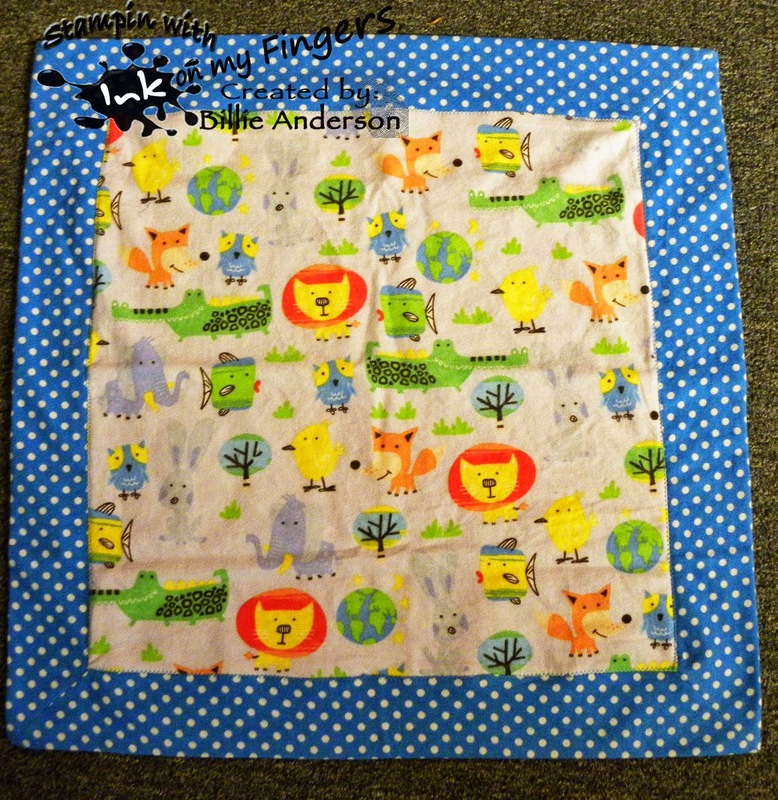 The back side of the burp cloth is blue like the blanket. This is for a co worker who is expecting in July. 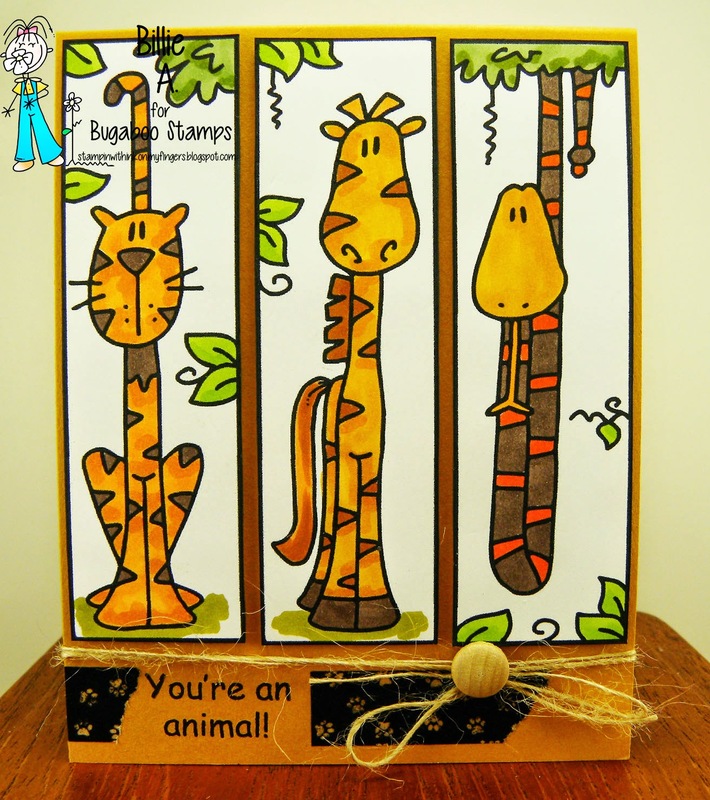 This is my Oldie But Goodie card using the Mini Set Tall Jungle images there are 6 images in the set. I used three of them.. The middle one is suppose to be a zebra but of course after I colored it I realized it. So to me its a giraffe. I wanted to kinda keep the colors monochromatic so this is what it is and will stay that way.. Great card for a boy. My grandson would love this. This is the card I made using the image Rebel.. I tried to give her a rebel look using the colored hair and funky colors. I don't think she is that much of a rebel.. I also made my background that is right behind her. I took some water color paper and added some strips of tape and then sprayed the water color paper, I let it dry then removed the tape and repositioned it and spritz again some more sprays. It gives a cool effect and thought it was perfect to add behind her. I chose a sentiment that I thought fit the card. I hope you play along and remember it's always anything goes. This is Ornamental flowers. I like the flow of the image. I really kept it simple as far as color goes. I wanted the image to speak by itself. I almost left it with out any color and it would of looked awesome. This would be a great simple card to make. It would also be good for mothers day, sympathy or like I chose birthday.. This scrap is just too awesome. It's another quick quote piece. I added the brown from recollection behind and the yellow is a piece of scrap and the brads are stampin up, they are sparkly glitter looking. Really gives a cool touch to the card. The envelope is from su dp. The sentiment is from simon says. Still on the theme of scraps.. I am having so much fun digging through the pile. I have made a small dent.. ever so small but it sure feels good making these cards. Hope I have inspired you in some way to make those cards that are just waiting to be made from scraps. This paper is from DCWV and I love the colors. To keep with the circle theme I die cut some circles from scraps and added the sentiment from Simon Says and it was done. I used recollection brown and the envelope is from su dp. also the green behind the orange is su dp. I wanted to make her other colors besides red and black and I know we have yellow ladybugs and other colors so I just played on some of those with her ribbon and part of her dress. I again made my own background. I used a large word stencil from Carolyn Dube and went over it with versa mark pad and then added clear embossing powder and once that was heated I took ranger inks and smeared them on my non stick sheet and spritzed with water then laid the watercolor embossed into the ink and dried it then added to the inks again till I got the effect I wanted. I pulled some of the colors in her dress from the background and added a little fun pink to her hair. I fussy cut her out. This is my card using the image Mood music.. I love it. I know when my four legged baby hears music up a little higher then usual he howls and it's so funny you almost do a roll over laugh. I made my own background design. I used watercolor paper, a music stamp from Francisco (are they even still around?) white embossed and H2O paints, got the effect I wanted and then colored the image. 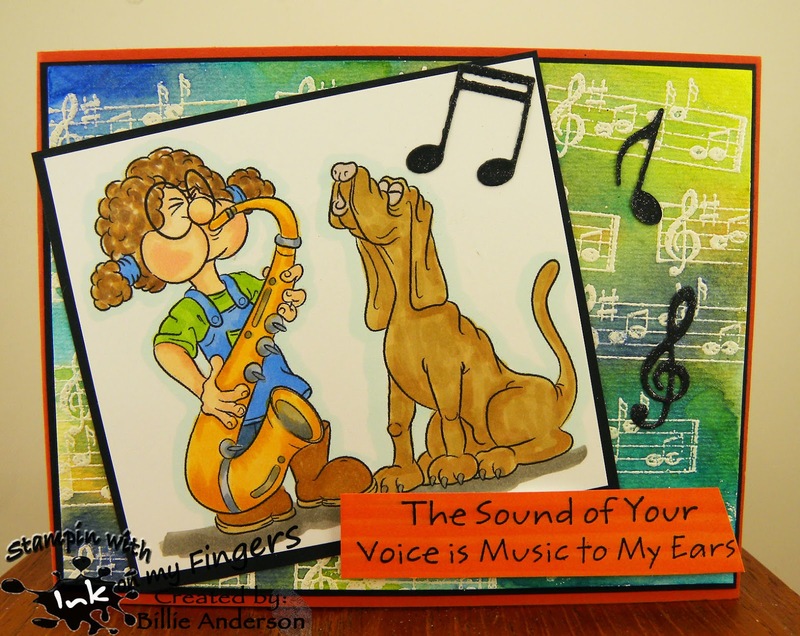 I added some die cut music notes from My favorite things and sentiment from MFT also. In the mean time this address below is the correct one for posting your cards in the challenge for this week. 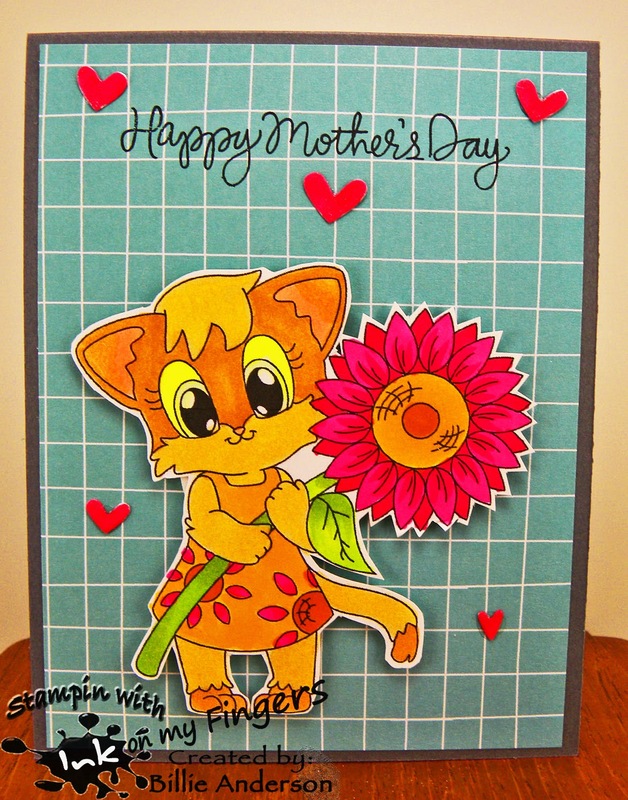 This is my card using Sunflower Kittie - but I always associate sunflowers with fall and it's only May so I made it into a pretty bright pink flower. Besides I wanted to make her in the orange tones - I don't have a cat and so never know what to color them and orange-ish comes to mind most of the time. 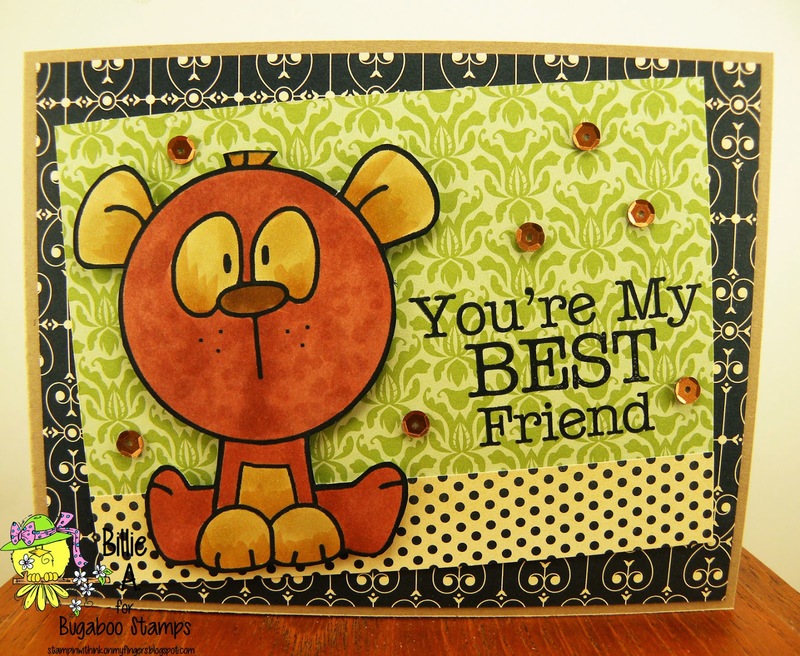 Anyhow this is the card and the added hearts are Simon says colored in copics. 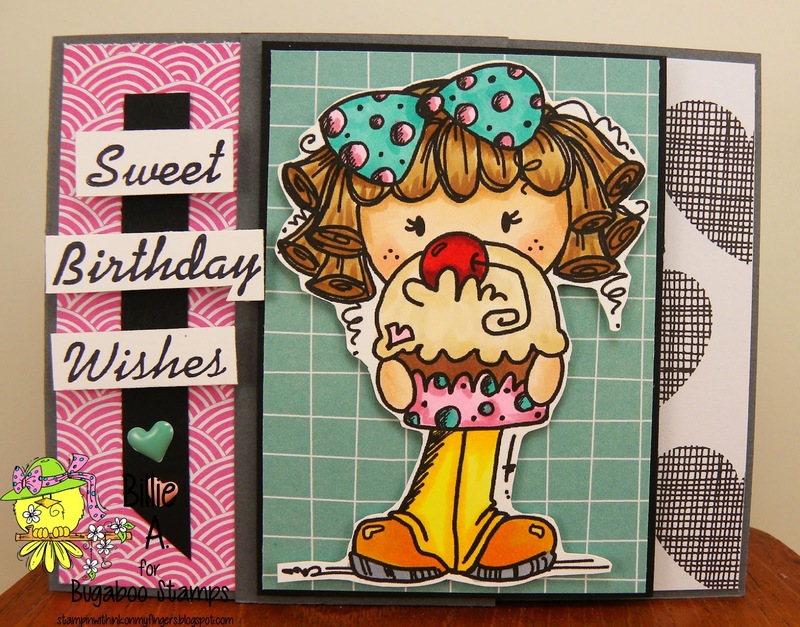 this is the new image called Cupcake Kidz.. She sure is holding a delicious cupcake.. I again made a card where the top is folded back. This time I folded it back two inches and added the designer papers which are from my favorite pad.. Amy Tangerine. The sentiment I have no idea who its by.. the card base is SU gray..
Well this was a no brainer ABC.. I have been thinking about this for some time and today is the day.. I have a day planner that I keep track of all my design team cards to post.. If I didn't I would be pulling my hair out. It keeps me so on track. 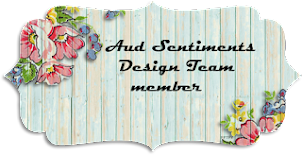 Well since I only use it for my blog I thought this was perfect place for the divider page. 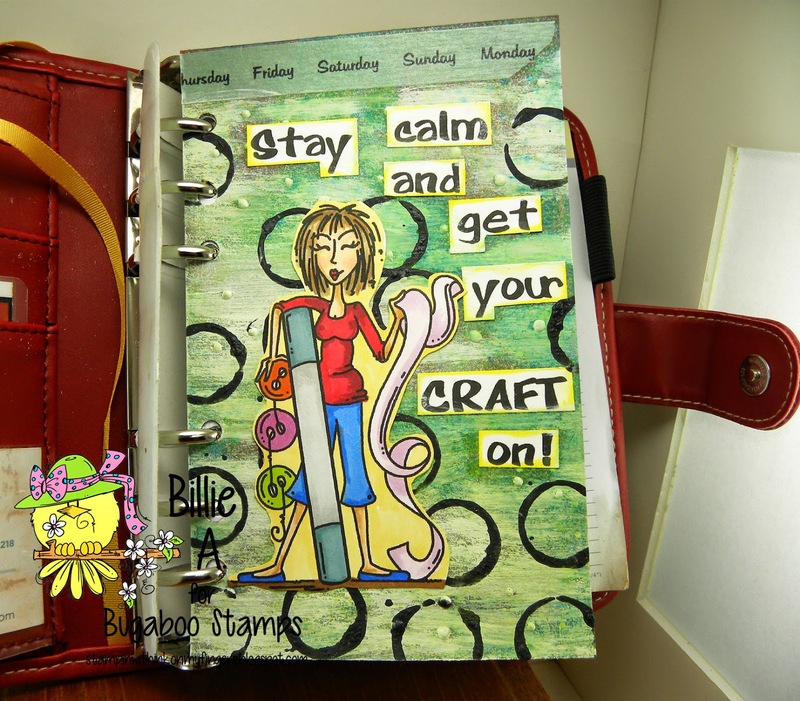 I used the image Girlz - get your craft on .. I took a piece of chip board and cut it down to my journal page size. (I should of used gesso on it but didn't .. next time I will) and I used different ranger paints all over it, and some sprays. I then dropped liquid pearls dots all over and let it dry.. Needless to say I did not care for it after it dried, so I watered down some white paint and brushed it over the page.. the paint and sprays bled through and kind a gave a nice look. It needed some punch so I took black paint and the cap to a spritz bottle and dipped it in the black paint and did the circles all over. I added the washi tape at the top that gives the week days.. I cut apart the sentiment that goes with the image and added it. I colored the image with copics and adhered it down. I am pleased with the look, but I sure learned a few things in the process for the next one. I did spritz the back side of the page so it looked more than just chip board. 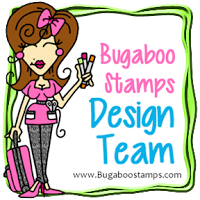 recipe: catch the bug/bugaboo - girlz get your craft on, chip board, various sprays, ranger paints, white paint, black paint for the rings, washi tape, liq pearls, copics. This scrap card was so simple. I had this map piece from Quick quote plus the red strip along the side is from qq. 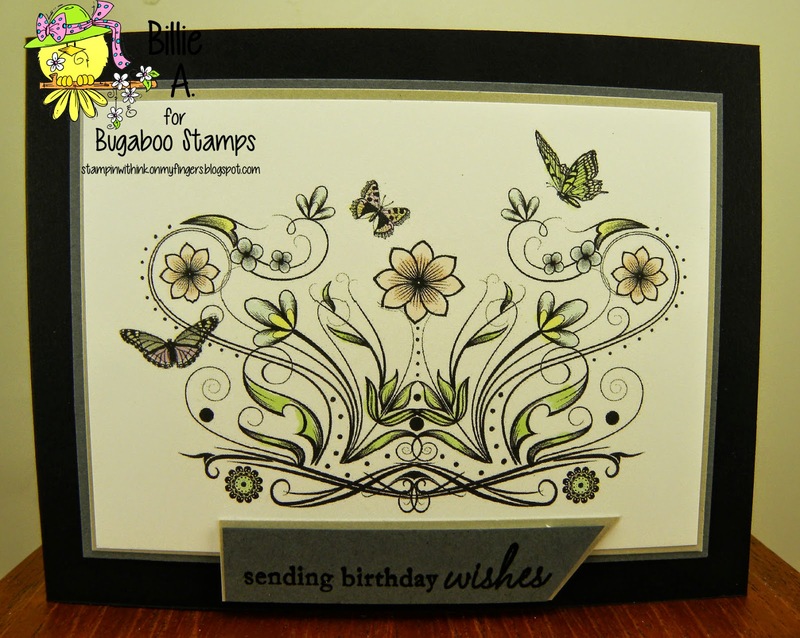 The die leaf is from Taylored Expression, the butterfly is one of the three butterfly dies from Stampin up. I used scraps. The button is from SU. the brown and turquoise behind is from recollections. 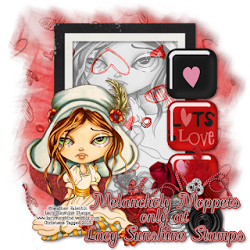 I know its after mothers day but I thought this image would be so cute for mothers day Happy mothers day I really like the orange with this blue and the scraps of paper I had from Quick quote was perfect for the card. I used my PTI flower die and made a few and added the buttons for the center. I stamped the sentiment on a strip and carried on the look behind the image with the orange dotted paper and stripes. 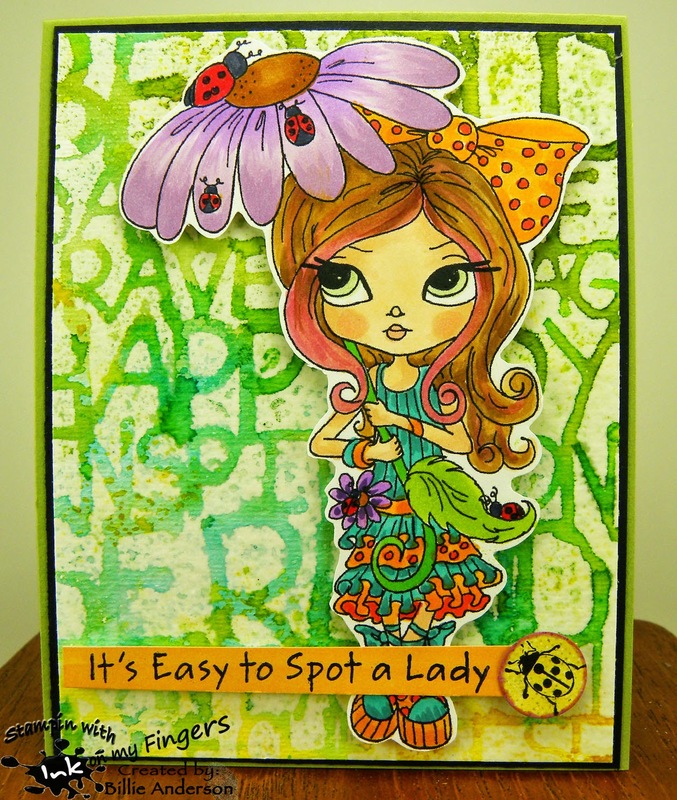 The image is on a spellbinder die. I did the tanish part of the ewe fur with some wink of stella. In real life it looks awesome.. Cute little card. I hope you head over to Catch the bug and play along. 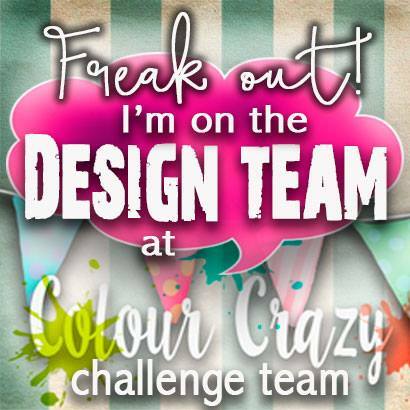 I am honored to be a guest designer at Scrapping 4 fun .. #42 challenge. 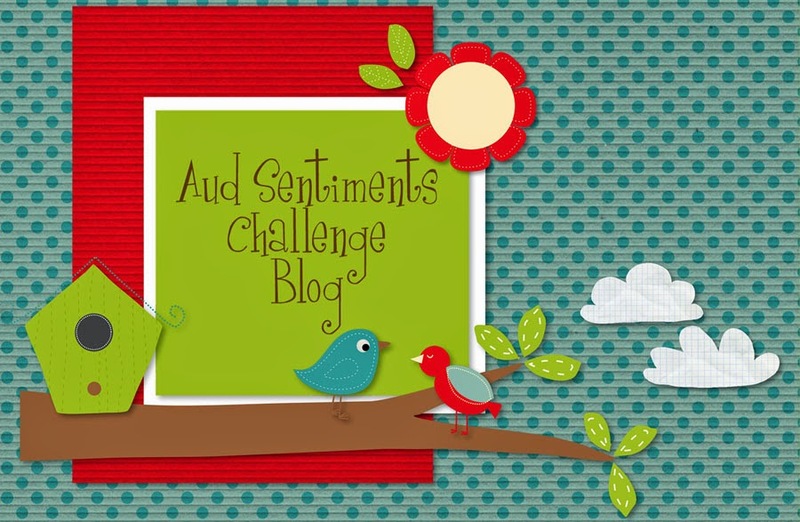 Thank you for asking me to join this two week challenge and for having an awesome blog challenge for us to play along. The theme for these two weeks is TECHNIQUES.. can be distress, inking, folding, coloring.. I hope my card encourages you to play along. This is the card I made. My technique is: I took water color paper, ranger distress inks in colors, tumble glass, warm lipstick, scattered straw, I smeared it down on my craft sheet. I then spritzed with water and laid my water color paper down. I then dried it and added it real quick to the ink bubbles that were still on the craft sheet, this gives the darker ink marks.. I love the look. I then decided not to use the stamp that I had planned and grabbed my PSX stamp and stamped it over the background water color and I just colored the leaves, the little bit of purple inside the flower and the orange. The rest is the water color look.. I LOVE IT.. I did distress the edges of the water color paper which is mostly because of my old cutting blade on my paper trimmer.. I thought I would go with it and distressed it some more. I then added black behind to make it pop and added it to pear pazaz paper from SU.. The sentiment is from PTI and a few sequins added. I am loving this. It's sure prettier in person.. 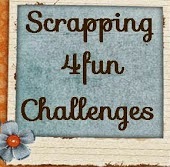 I hope you head over to Scrapping 4fun and play along.. I bought this 12x12 designer pad by Amy Tangerine and I love it. There are so many awesome papers in the pad. I thought this paper even though it was cut down (some times you loose so much when you cut down a 12x12) really kept the look I wanted. 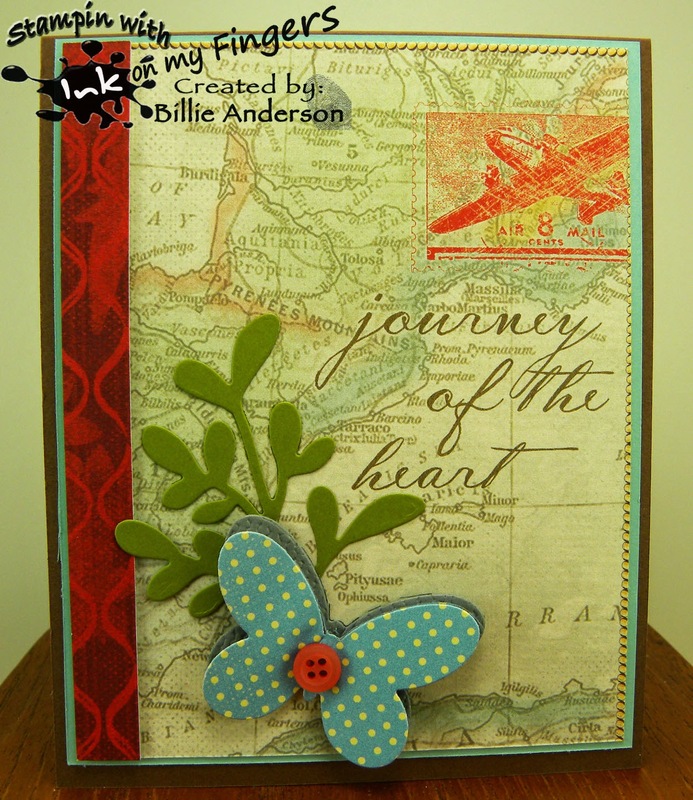 I just added the sentiment from Simon says and the designer paper and for the sentiment is from Stampin up. See the envelope behind the card? The little turquoise color is from recollections. Love this card. 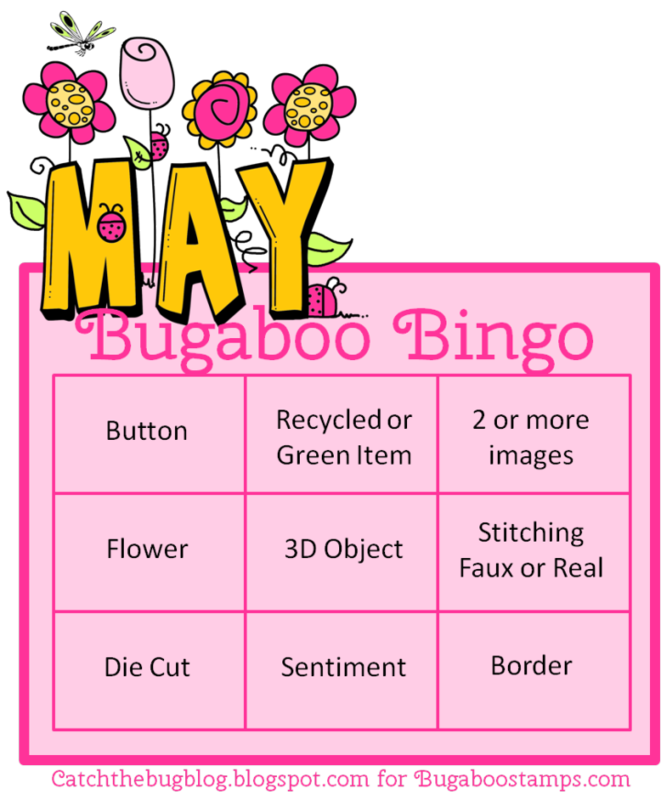 but until May 2th this will be the blog to post your cards. 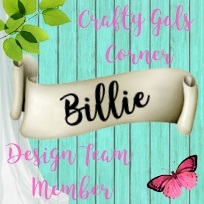 This is my card using the image Jules.. I think she is thinking of someone as she is either getting ready to send an email, or looking at face book or photos. I like her look. I made another BOKEH background. I like this one but you really don't see the dots I think I just used too many colors. I added the sentiment and then a flower using pti die. I added a brad to the center. I cut the image out and added her on some foam tape. I hope you play along and have a fun time. It's always anything goes. You can head over and follow us and be right on top of things come May 27th..
Ok I had to use this image. 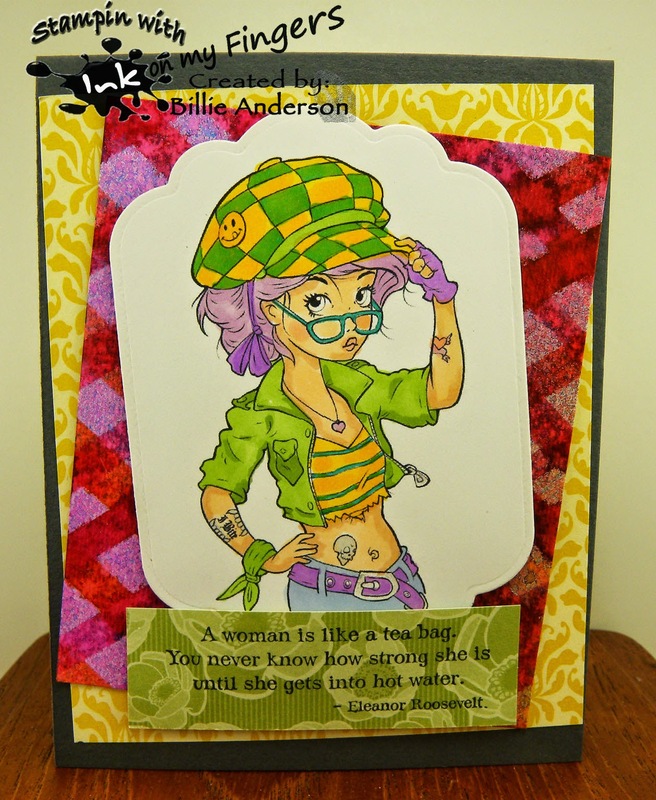 I love it and I tried to make her really a cool hip chick with the coloring.. Her name is Chickz cool chick I wanted to add what looked like a belt so I did the belt buckle and had this awesome ribbon from PTI.. it's quite old so I don't know if they have it anymore. I did the stitch lines on the sentiment pieces to go with the ribbon. I hope you play along at Inspiration Destination.. it's always anything goes so I know you have something to post. Oh I love the brightness of this card. It really pops.. 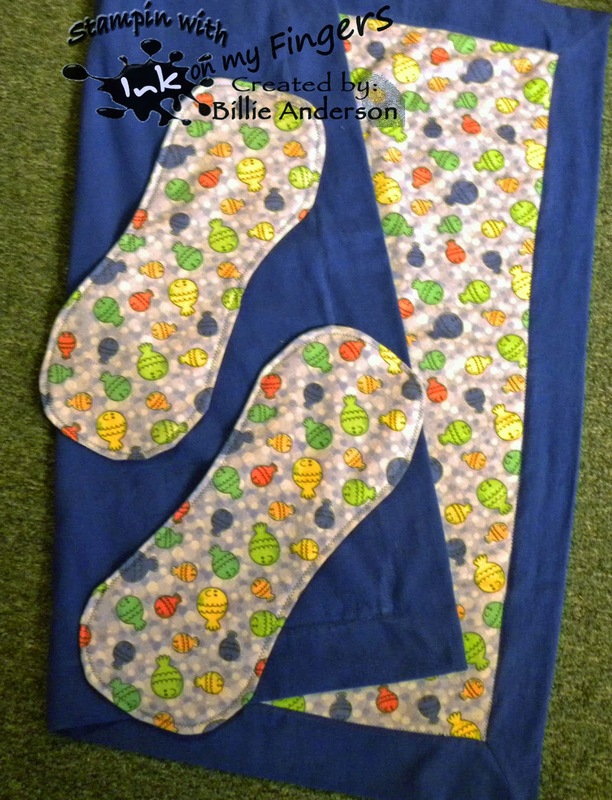 I folded back the front right side about 2 inches and added the scraps to those two pieces. 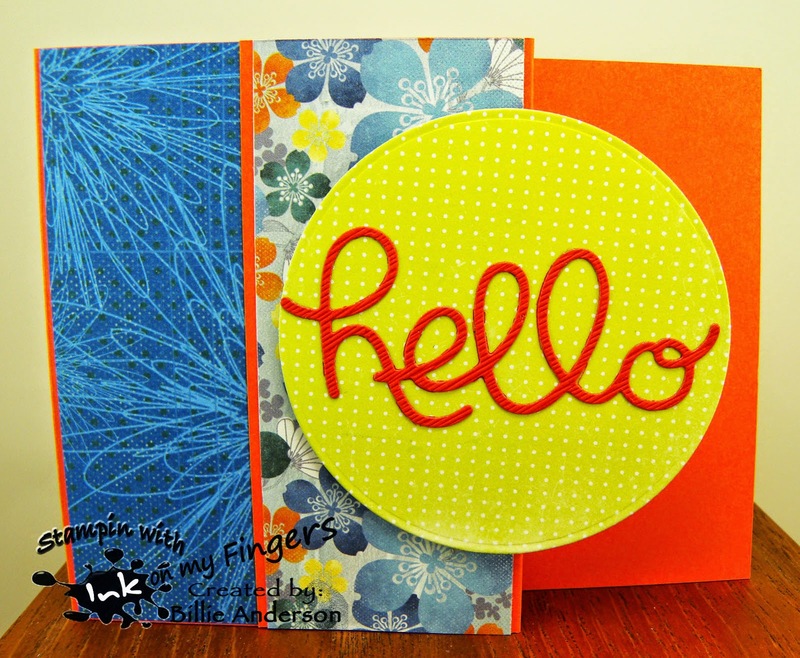 I cut the circle from MFT die and the Hello from SS. When the card is closed you see the orange on the right behind the circle and scraps. Love the bright fun card. 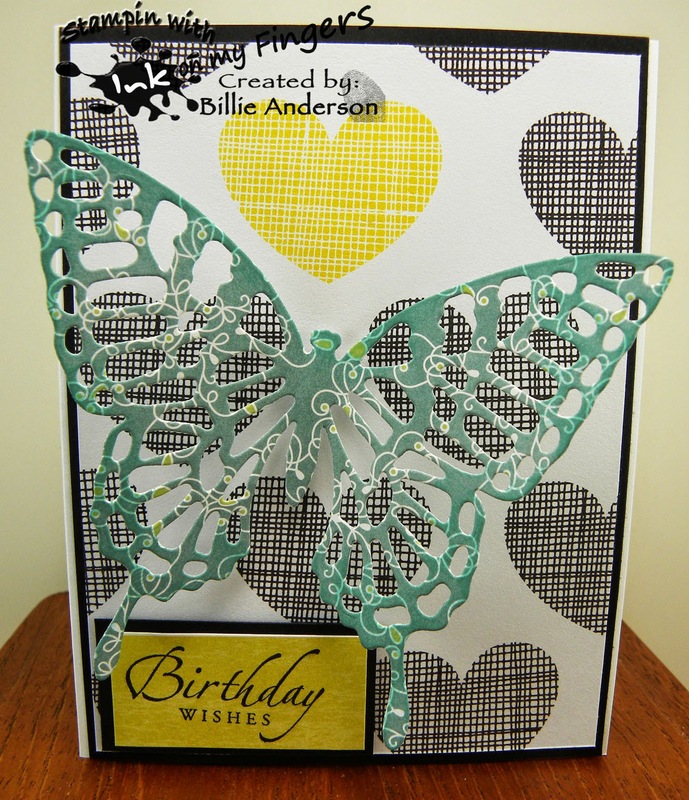 OH my I love this die from Stampin Up.. there are three butterflies in the set. This is the large one and it punches out so awesome. Trick I learned from my friend Karen is you put down the cutting plate, dryer sheet, card stock /paper, wax paper then the die then the top cutting plate, run it through your die cutting machine and when you cut it out the image just pops out and you don't have to man handle it to get the pieces out.. Awesome trick. Again I used a piece from Amy Tangerine dp. 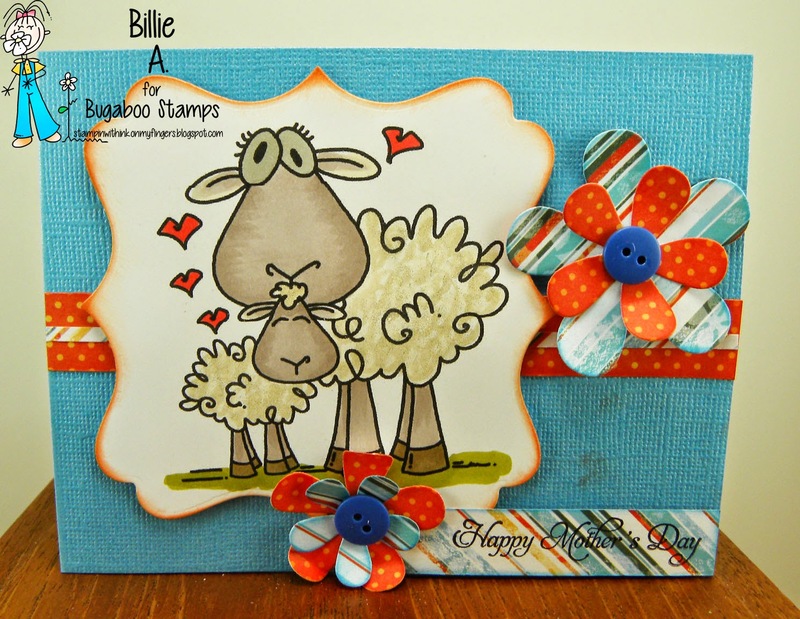 If you look at my Tuesday 4-28-15 card using the large Mom heart from CTB.. I used this same paper but covered the colored heart. 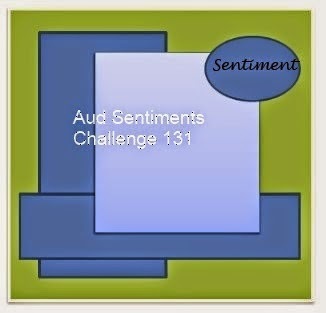 This I thought the yellow heart was great and then used a scrap of yellow for the sentiment which is from SU. The butterfly is out of SU dp. 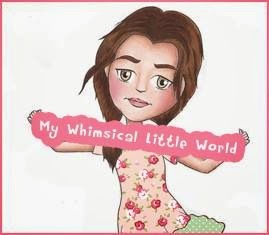 I am on a new design team called Morgan's Art World / Morgan Fitzsimons which was a part of Fitztown.. Fitztown is not a part of this new group anymore. 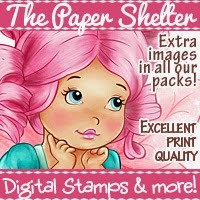 We will have a new blog and blog hop in June with awesome cards by the design team and new challenges.. But right now we are regrouping and there is a facebook page.. 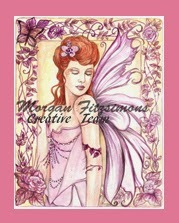 The Morgan Fitzsimons etsy shop will be open soon. 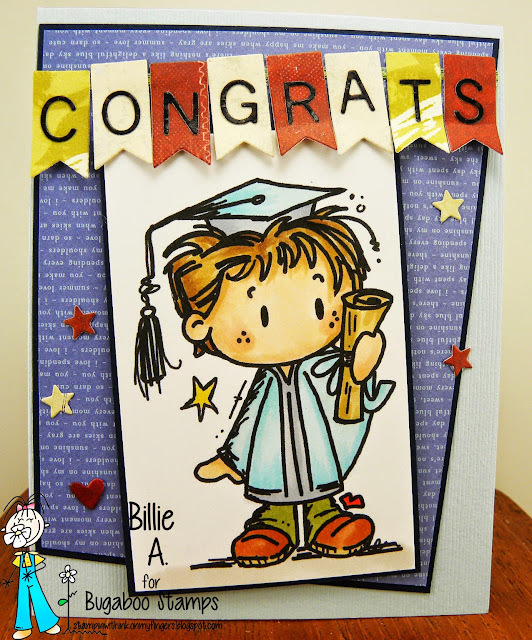 OK this is my card and I am in love with the background.. What do you think?? I have been seeing different U-Tube videos on watercolor backgrounds so stuck my foot in and got it wet.. I love it. I took watercolor paper, some re-inkers from Ranger and wet my paper so it was quite damp and then dropped on different colors and then kind of turned the paper to get it to blend and then spritzed with more water and turned it more to blend to desire effect. Dried the paper then did some water drops to give a nice distress look to the design, once satisfied with that I then took a Stampin up stencil of stars and watered down some gold paint and very lightly added the stars. I dried it all and then put it aside. I used the image Ballerina /4 dancer ladies colored her up and then cut her out.. I used the sentiment from Paper Pretties die cut with spellbinder die, and took some rayon thread and put it under the sentiment, added some sequins and called it good. Of course I colored the ballerina in copics. 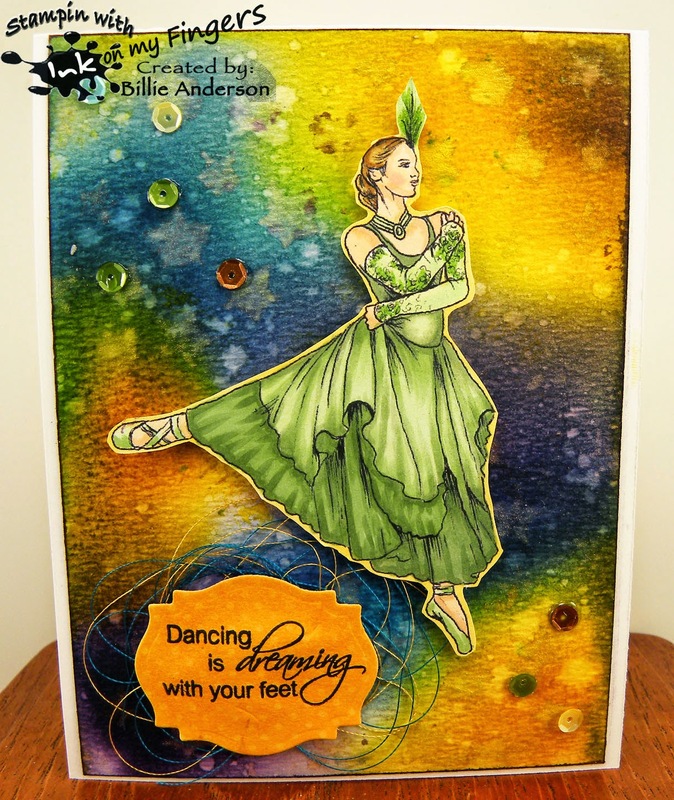 recipe: ballerina lady, ranger inks, water color paper, white su paper, scrap, sequins, sb die, rayon thread, copics, wink of stella on parts of dress and feather in hair. This is the darling Bobblehead Bear.. I thought that this sentiment went well with the image. 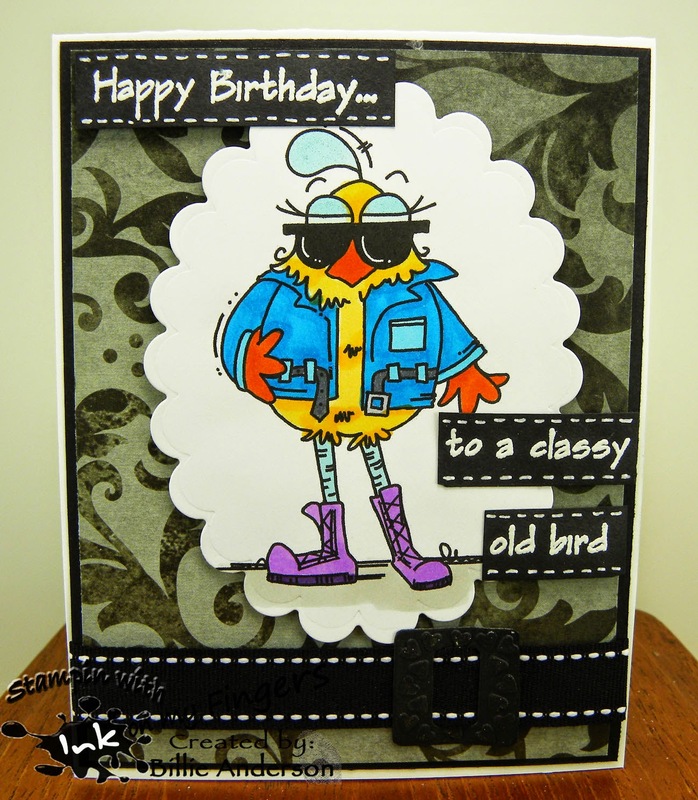 I used stampin up designer papers and some sequins. 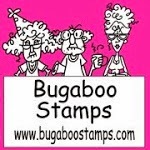 I hope you get over to the Bugaboo site and catch this image before it's not free. 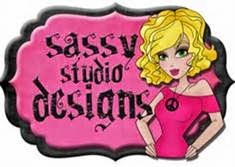 This is my card using the image Get Well Soon Sassy.. 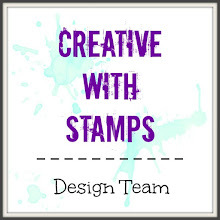 I used designer papers from Stampin up and the card base is stampin up. I pulled those colors for her couch and there is some awesome green in the design people also but it's covered by the image.. : ( and I love always having blue with those yellow/oranges.. Really pops. 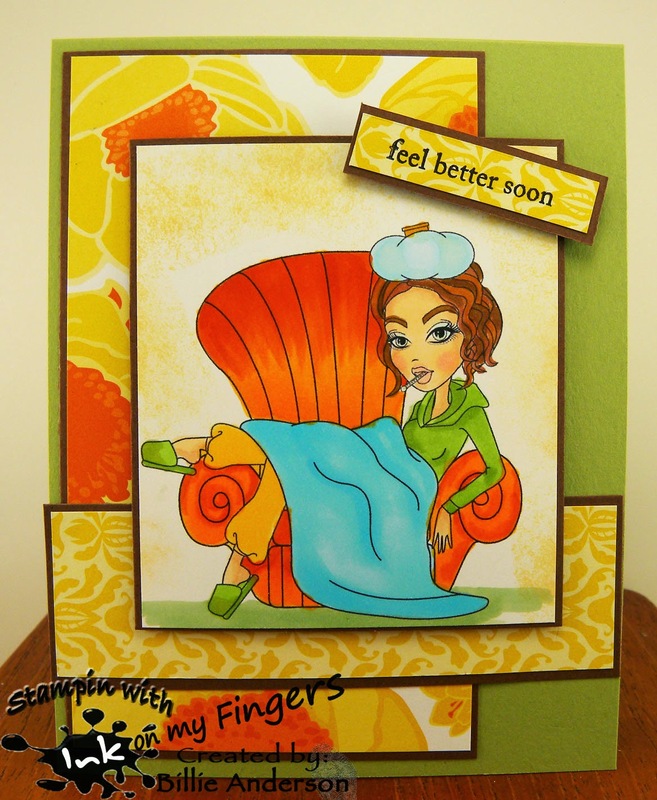 I hope who ever I get this card to will feel better soon and enjoy the card.